Billionaire investor Warren Buffett’s purchase of a large stake in truck stop operator Pilot Flying J and his plans to eventually take control of the business look like a contrarian bet. Hurdles such as low diesel fuel prices and a shift in shipping patterns that favors regional trucking and local delivery over long-haul freight have turned the truck stop business into a difficult financial play. A private company, Pilot Flying J doesn’t disclose much financial detail, but it has said that its annual revenue is about $20 billion, down by about a third from a decade ago. 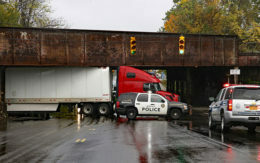 Other truck stock companies also face financial challenges. TravelCenters of America, the only big publicly held player in the space, saw its losses widen to $32.4 million for the first six months of this year from a deficit of $6.4 million in the same period a year earlier. Both diesel fuel and gasoline sales fell from their prior year levels. Shares of the Westlake, Ohio, company, closed Friday at $4.70, down from $6.85 a year ago and as high as $17.58 a share in March of 2015. Fuel, or the lack of it, is a looming issue for truck stops. Truck manufacturers are working to reduce the importance of diesel — the basic commodity of truck stops — by increasing the fuel economy of commercial vehicles. As a result, sales of over-the-road diesel fuel at truck stops have fallen by more than 4 percent over the past decade to 38.8 billion gallons in 2016, according to NATSO, the trade group formerly known as the National Association of Truck Stop Operators. “Trucks are getting a whole lot more efficient and, with time, there’s less diesel consumption per mile,” said Lisa Mullings, chief executive of NATSO. Even more troubling for truck stops, the price of diesel has fallen steadily in recent years, slicing into their revenue. The national average price for a gallon of diesel was $3.84 a gallon in August 2014, according to the Energy Information Administration. That had fallen to $2.60 by August before the recent hurricanes temporarily reduced refining capacity, pushing the price to $2.79 in September. Additionally, long-haul traffic — the kind that most utilizes truck stops — is declining, a result of the e-commerce-sparked boom in local and regional freight delivery. The number of miles driven in the U.S. by semi-trailer trucks peaked at 184 billion in 2008 and had fallen to 170 billion by 2015, the latest period tracked by the Department of Transportation. The shift has hurt truck stops, which cater to overnight drivers. Overseas sourcing and cheap water transport through ports bring goods to the U.S. close to the region of consumption. This shortens over-the-road length of haul and regionalizes freight, said Eileen Hart, spokeswoman for DAT Solutions, an industry data provider. In addition, retailers are trying to shorten the distance to customers and react faster. “Amazon has helped set a general expectation that when you order something, a one- to two-day wait should be your tolerance,” Hart said. Truck stops are developing new business models to respond to these trends. Many are attempting to lure more passenger vehicle traffic along interstates and in urban and suburban areas, using convenient fueling and attractive food offerings as a draw, Mullings said. Operators also are replacing old facilities with new, more efficient ones, said Gary Hall, a truck stop consultant based in Medford, Ore.
“We still feel like there’s an opportunity to grow,” said Ken Parent, president of Pilot Flying J. The Knoxville, Tenn., company plans to open up 15 new locations this year, bringing its total to 765 outlets and has 30 additional locations planned for 2018, Parent said. Industry-wide, the number of truck stops has remained at about 2,500 for several years. Also, Pilot Flying J is putting new facilities in non-traditional spots away from interstates, such as in suburban distribution parks, near ports and intermodal facilities, and on U.S. rural highways, Parent said. It’s also adjusting the size and shape of its stops. 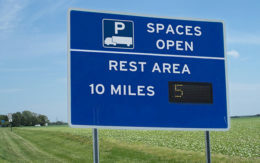 NATSO’s definition of a truck stop requires that the facility be open 24 hours, have at least two showers and offer at least 10 parking spaces. But many of Pilot Flying J’s new centers have smaller footprints than its traditional large centers, which are truck stops by any definition. The new outlets have only 5,000 square feet – or 9,500 square feet under roof instead of 15,000 – and therefore are less expensive to build and operate. These outlets have only a few showers instead of seven to 15 in the older stops. The shelves are stocked with only 70 percent of the merchandise selection of truck-safety supplies that are carried by a full-fledged facility. The company also now is attempting to attract a bigger share of trucker traffic by rolling out new food menus that offer more customized and healthier fare such as made-to-order sandwiches, salads, soups and pizza, at test stores such as in Lathrop, Calif. Pilot Flying J also is deploying new digital technology to relay parking availability to truckers. Using batteries of “microsensors” spread around the truck stop lot, drivers can access an accurate count of available spots at approaching facilities via a proprietary app. Other sensors provide the app updates on refueling wait times at each pump. Earlier this month Berkshire Hathaway, Buffett’s investment company, said it will acquire a 38.6-percent equity stake in Pilot Flying J for an undisclosed price. The Haslam family, the majority owners, will continue to hold 50.1 percent ownership. Another investor, FJ Management Inc., will retain an 11.3 percent ownership until 2023. Berkshire will become majority shareholder by acquiring an additional 41.4-percent equity stake in 2023. But the Haslam family will retain 20 percent ownership in the company. Indeed, longer-term industry predictions point to rising freight volumes. In a July industry report, the American Trucking Associations forecast freight volume will grow 2.8 percent this year and will then accelerate to 3.4 percent annually through 2023. Trucking will remain the dominant freight mode – moving 10.73 billion tons of freight in 2017, or about two-thirds of all goods. Industry consultant Hall also is upbeat. 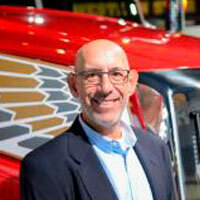 Editor’s note: Trucks.com editor Jerry Hirsch contributed to this report. You guys are certainly doing your research into the truck stop industry. Another great article about how people get their stuff every day… by trucks, drivers and the truck stop industry. This mix of people, truck equipment and facilities will continue to fulfill our demands for goods and services for decades. There is a lot of price gouging in both Flying J and Ta/Petro. When I started driving back in 2001 the average meal in one of their sit down restaurant were average of about 7 dollars for breakfast and $10 to $14 for lunch and dinner. Today truckers are looking at $12 to $14 average for breakfast and $ 15 to $20 for lunch and dinner. When Haslam bought up Flying J he took out the restaurants and stuck mostly Denny’s in their place. Some Pilots had good restaurants but the older truckers like myself prefer sitdown home cooked meals rather than fast food choices. TA and Petro but mostly TA has taken out their sit down restaurants and replaced them with fast food. Effingham, Illinois TA is one that I was shocked to find they had removed their sit down restaurant and buffet. I told the GM that I will no longer be stopping there and go to Petro down the road. Also I understand that they close instead of being open 24 hours. Flying J ‘s Dennys and Ihop are ok but they really tare a hole in our wallet. The Servers in either are really not that attentive to truckers they expect good tips with little or no service. I used to tip all my servers up to as much as 30% but something as easy as keeping my coffee or tea glass full was,to much of an effort for most of them. So ow if they do a poor job in my eyes then no tip. These places were once known as great places for truckers to stop and gather for a meal and unwind from work and talk. They are family. But now the shift is geared more toward the motoring public and RV travelers. It is sad truckers made you who you are and you basically have turned your back on them. So Mr. BUFFETT how is the Rairoad business?? Thanks your information in Warren Buffett the basic commodity of truck stops — by increasing the fuel economy of commercial vehicles.